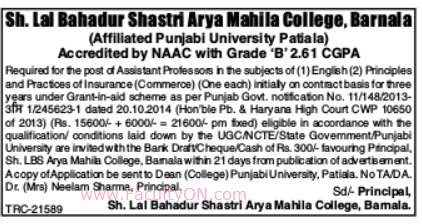 Sh.Lal Bahadur Shastri Arya Mahila College, Barnala has advertised in the TRIBUNE newspaper for recruitment of Assistant Professor jobs vacancies. Interested and eligible job aspirants are requested to apply within 21 days from 28th September 2018. Check out further more details below. About College: The college which spreads over 34 kanals of land is affiliated to Punjabi University, Patiala and has been showering rays of knowledge since 1968. The well-maintained, environment friendly college creates healthy atmosphere of freedom, confidence, individuality, fraternity, self-dependence, sense of responsibility etc. Application Fee: Rs.300/- payable by DD / Cheque / Cash . DD should be taken in favour of the Principal, Sh.LBS Arya Mahila College, Barnala.